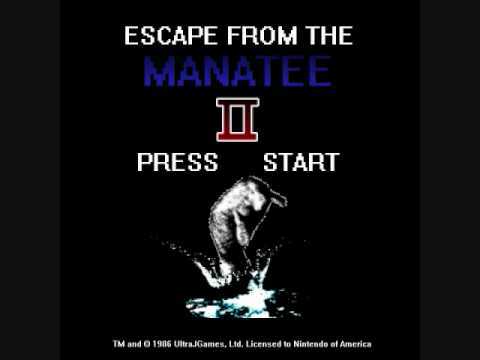 Title screen for “Escape from the Manatee II”, a thing that happened (at least twice) in the eighties. Imagine swimming out from the beach on a warm, summer day. You feel a tingle in your spine and the ba-dumping chords of the Jaws theme inexplicably rise from your subconscious. There is something in the water and it is going to kill you. The deadliest creature in the ocean has chosen you, and there is no escape. You panic. You scan the waves, searching for a sign, something that reveals the threat. Where is it? What is it?! You could be forgiven if you think, perhaps due to that ominous tune, a shark is stalking you. Despite their killer reputation, sharks rarely attack people and shark attacks, when they do occur, are rarely fatal. Perhaps you are fresh from a Marine Invertebrate Zoology course and your nightmares are now filled with images of cubozoans, the deadly box jellyfish. Box jellies may be extremely venomous, but they are responsible for less than 50 deaths a year and envenomation results in approximately a 20% mortality rate. Ah, but you’re clever, and you watch Discovery channel specials about the “Ten Most Deadly X in Y”, so you know that the deadliest creature is the ocean is the lethal sea snake, relative of the cobra. Clearly one must be stalking you through the shallows. Wrong. While sea snake venom is quite potent, only 1 in every 10 bites results in envenomation, and even then, the mortality rate is a comforting 10%. No matter how hard you look, you won’t see the monster slowly gliding up behind you. The deadliest marine organism is not a shark, a jellyfish, or a snake. It is not the beautiful blue ring octopus or the unassuming cone snail. It is not the giant squid, the killer whale, or the murderous, man-eating, manatee. The undisputed king of maritime mortality is the lowly bacteria, Vibrio vulnificus. False color SEM image of Vibrio vulnificus. Public Domain. Vibrio vulnificus is a marine bacteria common in estuaries and other brackish waters. It is often associated with oysters, but can also be found floating freely in the water column. V. vulnificus does not tolerate high salinity, so it is not found in the ocean or in high salinity coastal regions. V. vulnificus has been isolated from all US coasts and can be found in estuaries throughout the world. Vibrio vulnificus is closely related to its more notorious cousin, V. cholerae, which causes cholera. Much like its choleric kin, V. vulnificus is highly pathogenic. It holds the record for fastest reproducing bacteria, with cell-division happening in a matter of minutes. Unusual for infectious bacteria, V. vulnificus has two distinct pathways into its human victims, with two distinct pathologies–it can infect you through open wounds in you skin or it can get to you through your digestive system when you accidentally consume it. 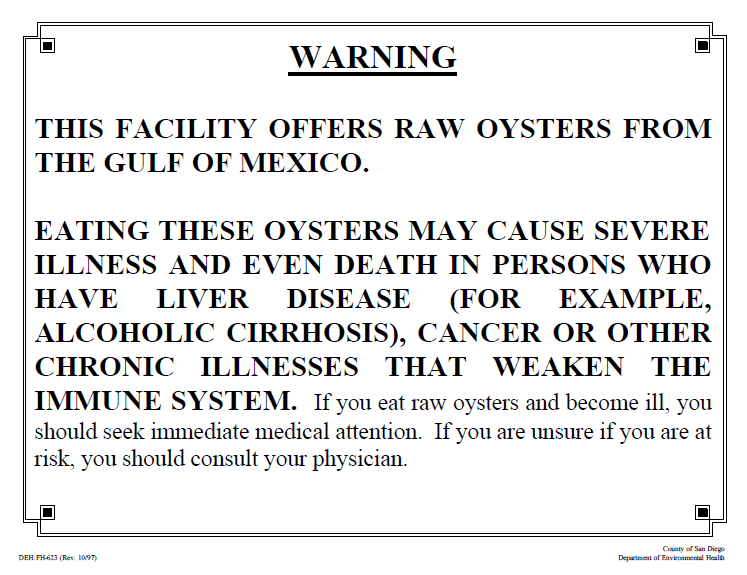 An example of a raw oyster warning commonly posted in restaurants. If you’ve encountered Vibrio vulnificus before, odds are that encounter was in the context of oysters. Most V. vulnificus infections in the United States come from the consumption of raw oysters. Surprisingly, even though raw oysters are considered a bit of a luxury food, and are consumed far less often than common, pathogen-containing staples like spinach or eggs, V. vulnificus infections account for almost 25% of all fatal food poisonings in the U.S. 95% of all seafood-related illnesses that require hospitalization are the result of V. vulnificus infections. Vibrio vulnificus poisoning is a pretty nasty ordeal. The luckiest victims with experience prolonged diarrhea and abdominal pain (symptoms may last for more than a month). For those less fortunate, these symptoms are followed by fever and primary septicemia. Secondary lesions form on the legs and other extremities, resulting in necrotizing fasciitis–affected limbs often require amputation. V. vulnificus will literally begin eating you from the inside out. Symptoms usually appear within 24 hours of ingestion, and, for those who fail to receive treatment after 72 hours, death is almost certain. V. vulnificus primarily affects men–86.5% of patients are male and 95% of those males are over 40. Men with liver diseases are particularly vulnerable, as is anyone with compromised immune systems. Although the molecular pathways are not known, estrogen appears to inhibit V. vulnificus growth, which explains the low infection rates in women. Raw oysters aren’t the only way to become infected with Vibrio vulnificus. In addition to accumulating in oyster tissue, this bacteria thrives in coastal and estuarine water. Exposed wounds (even something as small as an ant bite) provide a secondary pathway for V. vulnificus infection. And yes, infection through wounds can also be fatal. Necrotic lesions form at the site of the infection and slowly spread. In extreme cases, amputation is often the only treatment. If left untreated, secondary septicemia can occur. Mortality rates for wound infections are 20-25%. Climate has an effect on Vibrio vulnificus distribution. Both temperature and salinity are strongly correlated with V. vulnificus occurrence. When salinity is too low, the bacteria cannot grow, too high and they will die. When drought struck North Carolina in the early 2000’s, the elevated salinity reduced V. vulnificus occurrence to zero. Only in the last few years has V. vulnificus rebounded. Likewise, the bacteria thrives at higher temperatures, August being the prime month for V. vulnificus in North Carolina. A few degrees is the difference between abundance and absence. As the oceans warm, V. vulnificus is expected to experience a range expansion. Already, reported cases from northern countries bordering the Baltic Sea are on the rise. Vibrio vulnificus is tough. Even in inhospitable conditions it can enter a viable, but non-culturable, state. Though they cannot reproduce, cells remain viable and can resuscitate once conditions improve. This allows V. vulnificus to rebound rapidly when conditions improve. They are never truly gone. All of which provides a pretty good case in support of oyster roasts, especially considering that oysters grilled over a nice, lump charcoal fire are delicious. For a more detailed analysis of the biology and pathology of Vibrio vulnificus, check out this review.